During the second harvest in 2016, farmer Fred Kisubi lost everything. His region, Jinja District, Uganda, was devastated by fall armyworm. The unforgiving pest decimated approximately 95% of his maize crop within days, an estimated 18 million Ugandan Shillings (US $4,860) loss. Unfortunately, Fred Kisubi’s losses are not unique. 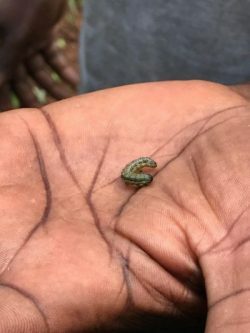 Since fall armyworm was first confirmed in West Africa in early 2016, the invasive pest has now been identified in more than 30 African countries, including Uganda. The rapid spread of fall armyworm has caught farmers and those who support them (such as agricultural extension agents) off guard. Many farmers struggle to identify the insect and appropriate interventions. In response to the emerging threat, Feed the Future and its partners, Land O’Lakes International Development and the Foundation for Food and Agriculture Research, launched the Fall Armyworm Tech Prize. This prize is seeking digital tools and approaches that can provide timely, context-specific information about fall armyworm in Africa to smallholder farmers and those who support them. For a digital fall armyworm tool to be successful, it must reflect local agricultural needs. The following perspectives from farmers affected by the pest in Uganda will help Fall Armyworm Tech Prize competitors understand the impact of the pest and the needs of farmers to help guide their digital solutions. Fall armyworm has devastated countries across Africa for more than a year and a half. In Uganda, for example, farmers have suffered significant losses in agricultural crops. In Uganda in 2016, maize production totaled 2,663,000 metric tons. The Economic Policy Research Centre’s Uganda Business Climate Index estimates a potential loss of 400,000 tonnes of grain (15% of 2016 production) equal to US$ 200 million due to fall armyworm. Samuel Luswago, a farmer in the Luweero District of Uganda looking for fall armyworm. Photo Credit: Nesta. Fall armyworm’s degree of damage varies in part because of how farmers are able to respond. Samuel Luswago (pictured above) lost approximately 75% of his maize this past season. Kaddu Lutwama, a large-scale farmer, on the other hand, managed to reduce his losses to 15%. Part of the reason for this disparity is access to information. The Ministry of Agriculture, Animal Industry, and Fisheries (MAAIF) distributes information to farmers using a variety of mediums: word of mouth, newspapers, radio advisories, television notices, and internet guidance. Each method of communication introduces limitations. MAAIF can only provide so many details during a radio spot, for example. Though agricultural extension agents can cover large swaths of territory, they are not always immediately available to consult with farmers. Online advice on fall armyworm is extensive; however, farmer literacy and internet connectivity is uneven. 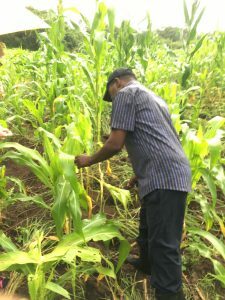 Because Lutwama has access to the internet, he learned about the pest’s lifecycle, how to treat and prevent it, and this information enabled him to minimize maize losses. Luswago did not have the same access to information. By the time he learned of treatment and prevention methods, his crop had been destroyed. According to agricultural experts, farmers, and extension workers in Uganda, the most prevalent response to fall armyworm is the use of pesticides. Professor Samuel Kwamanya, an entomologist at Makerere University, notes that farmers have tested a range of pesticides, resulting in “pesticide concoctions.” Every farmer has a different experience with pesticides. Pesticides have worked immediately for some farmers, whereas other farmers have seen no impact. This is due to a variety of factors. Chris Ninsiima from Bukoola Chemicals Industries, a lead pesticide distributor, stressed the importance of teaching farmers the correct usage of pesticides to combat fall armyworm. This includes how to spray, when to spray, what pesticide to use, what dosage to apply, and how often to apply. While pesticides can be effective, they come with caveats. Many of them are expensive, harmful to the environment, harmful to human health, and can lead to pesticide resistance. Farmers noted that information from government ministries and international institutions does not necessarily reach them, and, if it does, it often goes through multiple channels before they receive it. By the time the information gets to farmers, it may be too late. Most farmers admit that they know very little about the life cycle and biology of fall armyworm, even though this information could better prepare them to combat the pest. 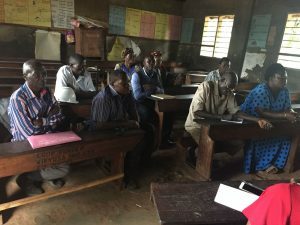 When asked what solutions might be most useful, farmers suggested a two-way call center, an app that provides reliable information to extension workers and farmers with smartphones, a peer-to-peer network, and images to help them identify the pest. The vast majority of farmers have basic phones that can receive SMS and MMS, though a growing number of farmers are now using smartphones. It is important that solutions can be applied to both technologies to ensure that all farmers are getting the same information in time to make a difference. Farmers suggested that visual information and demonstrations are often easier to understand than text. Given the rapid spread of fall armyworm, agricultural extension agents alone can’t provide demonstrations to every smallholder farmer. The Fall Armyworm Tech Prize will help provide smallholder farmers with more information in less time. We’re counting on you to develop and adapt your best digital tools and approaches to help farmers and extension agents identify, treat, and track incidences of fall armyworm in Africa. The deadline for entries is May 14, 2018 (23:59 EST). If you would like more information, please visit the application platform.